This very simple composition integrates a miniature waterfall with the sentinel stone placement and raked stone surface reflective of traditional Japanese garden design*. 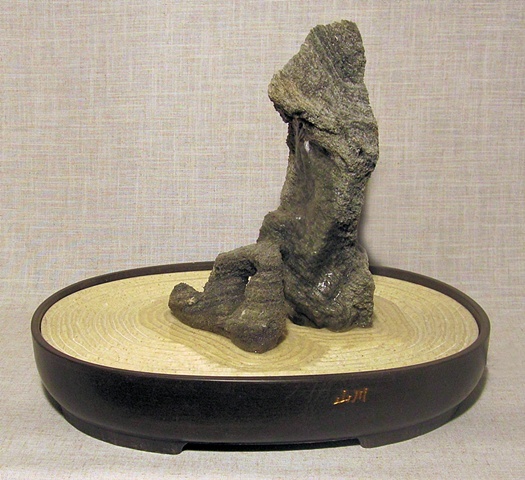 The Korean tray, a casting of 85% mica and graphite, was sealed with a clear lacquer. Below the lip of the tray are the Chinese characters “shan" and "chuan" (mountains and streams). *Mansfield, S. (2009). Japanese Stone Gardens. North Clarendon: Tuttle Publishing. pp. 54-69.